Hull #2 of the Sport Yacht 135 Series, designed by Nuvolari Lenard, DRAGON has a visually striking exterior design & modern interior. Specifically laid out to emphasize open flowing spaces within geometric patterns in her 5 staterooms arrangement. Large deck spaces are perfect for relaxing and entertainingand enhance the ease of moving through the yacht as well as coming aboard and enjoying the water. Very well maintained by original owner, low hours, 10 Yr survey completed Nov. 2017. DRAGON is a unique opportunity in a luxury sport yacht, ideal for family cruising, entertaining or charter use. United Yacht Sales New Jersey would love to guide you through a personal showing of this 134' Palmer Johnson 135-2 Sport Yacht Series 2007. This yacht for sale is located in Cogolin France and priced at $11,500,000. For a showing please contact us by filling out the form on this page and we will get back to you shortly! Aluminium hull & superstructure with teak decks. Welded construction. Scantlings and plate to Classification requirements.FRP composite structures, assemblies. Vinyl ester resin throughout for superior blister resistance. 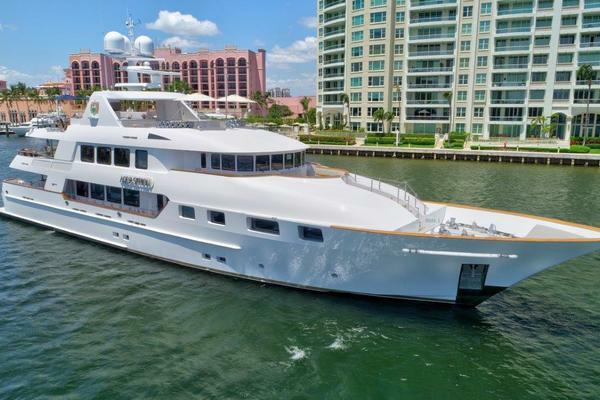 Starting with the large Aft Deck, there is a dining table with seating for 10, a bar with refrigerator, and broad stairs port & starboard which lead down to the large swim platform with self deploying swim ladder. There is also a 5.5m passarelle for ease of boarding. At the transom, the hydraulically operated garage door is large enough to double as a shaded staging area for dive equipment and water toys on the platform. Two jet skiis are housed, and there is also a Glendenning CM-8 cable reel with 75 ft. shore cord, and fresh water wash down.Going to the Foredeck, there is an 8-person jacuzzi surrounded by sun pads. When it is not in use, a solid teak top is placed over, converting it to a table. There is also a bimini top which can be used to cover this deck area. Behind the jacuzzi is the 2nd tender garage, also hydraulically powered with beam-wide system, which houses the 17' Novurania tender and 2500 lb. crane/davit.Moving forward from the Aft Deck in to the Main Salon, there are numerous sofa, easy chairs, and walking spaces. The interior design emphasizes modern geometric patterns with form following function and an architectural feel; red, white & black color schemes and open areas which create a flow through the yacht. The decor also features a variety of materials including brushed aluminium trims and leather bindings.The Dining Salon adjoining is separated by a stretch of cabinetry. There is black African wenge wood used for the flooring and dining table which seats 10. Port and starboard cabinets provide tableware storage. A full service bar with marble top is accompanied by an undercounter icemaker/refrigerator.A 42" TV/entertainment center with Surround Sound is centered between the two salons, set at floor level on a swivel so it is easily viewed from any angle in this large open space.Forward on the main deck is the Pilothouse which echoes the color scheme and features Fly by Wire electro-hydraulic steering and twin Stidd adjustable helm chairs. With broad windscreens facing instrumentation - including radar, satellite navigation and performance - all monitors and panel switches are arranged within easy scan and reach. To port is a computerized nav station. Alarm systems, including engine room, bilge, fire and fuel tank capacities are monitored continuously from this central location. Just outside the Wheelhouse, port & starboard, are auxiliary control stations which open and allow full helm authority from the wide side decks. The extra large windscreens in the Wheelhouse have oversized wipers and provide high visibility to the captain and observers.A passageway forward of the bridge leads to the Crew's quarters, located in the forepeak, with separate galley, then 4 crew cabins, 3 with twin bunk beds and the Captain's cabin with double berth.Going down to the Lower Deck, the full beam (28') Master Stateroom continues the interior design theme with the wenge African hardwood flooring, and Exotic leather finishes the king size berth headboard. The Owner's seating area/lounge includes sofa, chair and coffee table, with a lamp in burnished gold. The vanity is also covered in exotic leather, and with the wenge wood trim.The ensuite Master Bath is all white, with wenge trim, white onyx walls and marble flooring. It features His and Hers toilets, bidets and sinks, with modern fixtures throughout.Two VIP Staterooms, facing forward, are located port and starboard. Each features cedar-lined hanging lockers as well as ensuite heads with identical design in each cabin. Both have full length mirrors and storage cabinets as well.Two Twin Staterooms, convertible to doubles, are located forward and side by side, with leather paneled walls and overhead lighting. Each includes an ensuite head/shower. One cabin has an extra fold down bunk as well.Up to the Flybridge, the large open space is wholly devoted to a lounging area, with no second helm station. There are deeply padded sun mattresses and lounge chairs, a full service bar with stools, plus a BBQ grill, refrigerator and icemaker.A unique aspect of "DRAGON" aside from her striking visual design is the openness which is emphasized throughout her interior and exterior spaces.